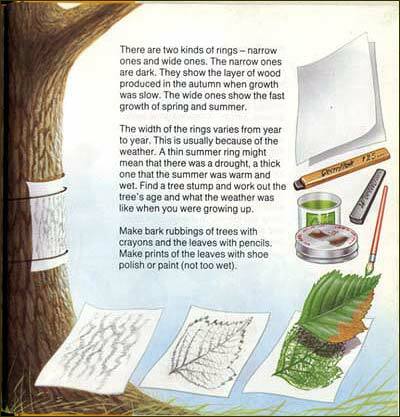 Making a leaf rubbing is a popular activity that surfaces frequently in my preliminary survey of activity-related books about trees published between 1972-1997. The creation of the rubbing can be illustrated many different ways, including in a single image, as in one example below. Here there is a variety of approaches in terms of illustrative style and layout. 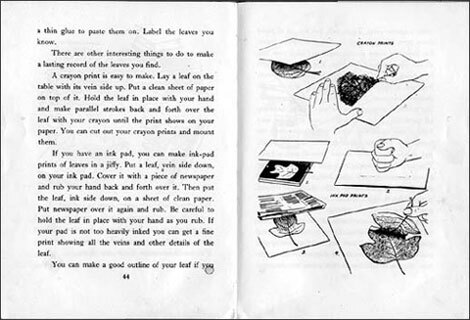 I would also draw attention to how much and what kind of context is depicted in the layout: note whether or not a child is included in the instructions, how much of the body is shown, and how the activity is connected to learning something about the tree. The direction of the steps varies widely: in the first spread, the steps zig-zag down without background images or step numbers to direct the viewer. Here we read the page by inference as to which is the next logical step, aided by a natural tendency to read top to bottom. In figure 2 the direction is clearly layed out, though it unconventionally moves counter-clockwise around the page. 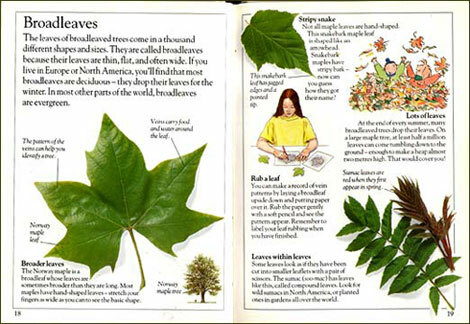 pp 44-45 of Things to do with Trees by Millicent Selsam, London: Chatto & Windus, 1972.
p 29 of Plants in Action by Robin Kerrod, Bath: Cherrytree, 1988.
pp 18-19 of Trees (Eyewitness Explorers) by Linda Gamlin, London: Dorling Kindersley, 1993.